"I have the strongest Bit-beast in the world"
The above info came from fun e 1, and was edited by yours truly (contact me). The image came from Beyblade Trading Card Game. Wyatt is a kid who is a HUGE fan of Kai's. 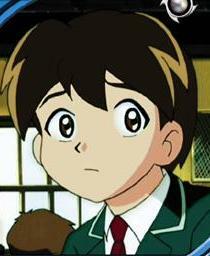 He's a kid who goes to the same school as Kai. One day when he was training in a gym, Team Psykick comes and gives him an offer that they knew he couldn't refuse. To defeat Kai in a Beybattle. So they took him to the lab, and training began. When he finally masters Cyber Dranzer, it's finally time for the Beybattle. He finds Kai, and tries to Beybattle him. Dunga steps in, and battles with Wyatt instead. It turns out that Wyatt didn't really master the Cyber Bit-Beast, so Wyatt goes all loopy and stuff, and they don't finish the battle. Dunga almost gets knocked out. After that, Kai swore that he would take down Team Psykick, for Wyatt. Then we don't know what happens to him. Although it's never actually stated, the impression is given that Wyatt dies. Once, Tyson said "You've lost Wyatt, Kai, don't lose your self! ", and then later Kai says "Wyatt was a brave Blader!" (the keyword being "was"). 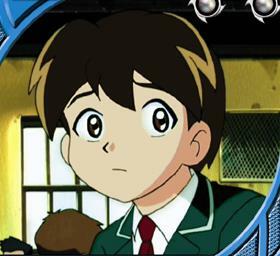 Also, at the ending of Beyblade, they had a two minute clip and it showed everyone in Beyblade (even the people that didn't play a big role in the show) and what happened to them. Wyatt wasn't in the clip. The above description came from fun e 1, and was edited by yours truly (contact me).